Makes 9 - 10 cupcakes. Line muffin tin with cupcake papers; set aside. Divide batter among cupcake papers, filling each ¾ full. Bake for 15-20 minutes. Let cool before frosting. In a stand mixer fitted with the whisk attachment, mix together the butter and confectioners’ sugar. Begin mixing on low speed until crumbly, and then increase to high and beat for 3 minutes. Add vanilla extract and beat again for another minute until light and fluffy. Transfer 1/3 of the vanilla frosting to a piping bag fitted with Ateco 40S decorator tip or Wilton drop flower tip 2D. Beat the remaining frosting on medium speed, adding the red food coloring in a little at a time until the desired pink color intensity is achieved. Add strawberry extract or strawberry flavoring oil. Transfer pink icing to a piping bag fitted with a large open star tip, Ateco brand #828 or Wilton tip 8B. Pipe small stars of icing around the outside edge of the cupcakes with the white vanilla frosting. Pipe a large swirl of pink frosting in the middle of the cupcake, making two passes with the piping bag. 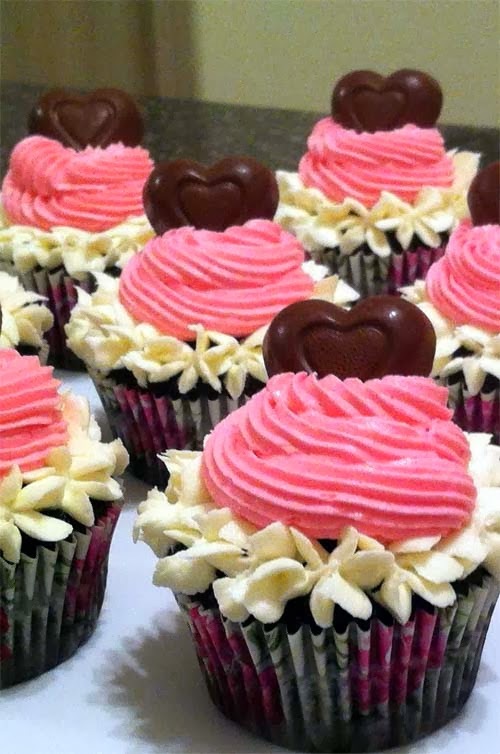 Top each cupcake with a chocolate bonbon.